ToyNewsI.com has posted some pictures of the new Pac-Man toyline coming from Bandai based on the upcoming new cartoon series Pac-Man and the Ghostly Adventures. Gross goo & ghost eyeballs spewing action just like on the show! 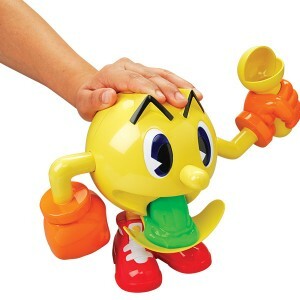 Drop the goo in, press down on Pac’s head and check out the goo spewing action! With Gooage Spewing Gigantic Pac-Man the “grossly” adventures never end. “Spewing action just like in the show?!?!? !” What kind of cartoon is this? Click here to see all of the new figures and news at ToyNewsI.com! My first impression is that its gunna be like Nickelodeons TMNT, but im in, I like Pac-Man, will they bring back Mezmeron? ?